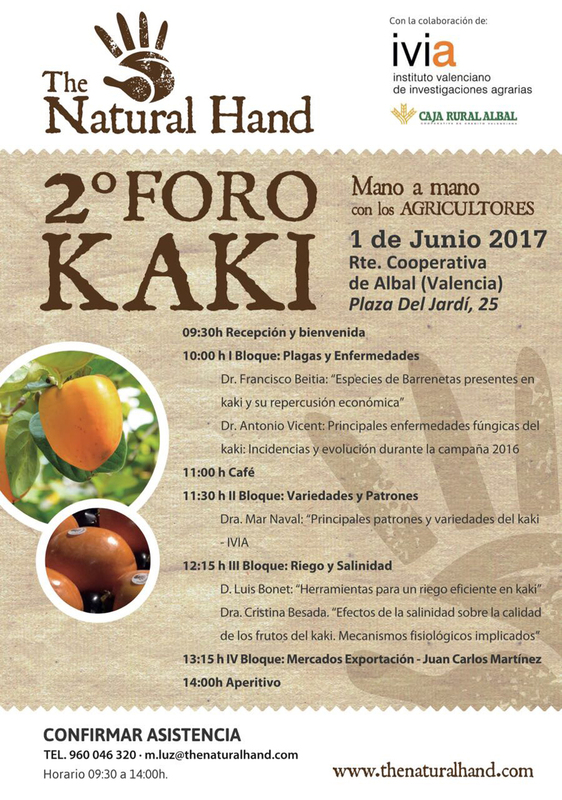 On June 1st, The Natural Hand organized the second edition of the Kaki Forum in Albal, Valencia, sponsored by the Valencian Institute of Agrarian Research (IVIA) and Caja Rural. The technical meeting, which gathered companies and professionals from different agricultural areas of the province, developed through a series of lectures on topics, such as the main kaki fungal diseases, tools for efficient irrigation, export markets or the main patterns and varieties of this fruit. Specialists such as Francisco Beitia, Antonio Vicente, Mar Naval (IVIA), Luis Bonet, Cristina Besada and Juan Carlos Martínez, CEO of The Natural Hand taught these lectures. The day ended with a snack for all attendees.